Grasshopper Rock is one of the world's southern most vineyards, established in 2003 and dedicated exclusively to Pinot noir. Grasshopper Rock is grown, made and bottled in Central Otago, from Pinot noir grapes, sourced exclusively from our 7.8ha Earnscleugh vineyard. 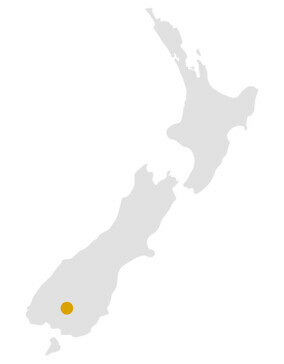 The vineyard is situated on Earnscleugh Road, across the Clutha River from Alexandra. The site enjoys high sunshine hours by day and very cool temperatures by night and is sufficiently harsh and difficult to make the vines work their hardest. With extremes of heat and cold comes the risk of spring and autumn frosts, providing a demanding but rewarding environment for the production of premium pinot noir. Grasshopper Rock takes it name from the endangered protected species of grasshopper Sigaus childi found near the vineyard. Clyde Wine and Food Harvest Festival is held on Easter Sunday each year in the main street of Clyde in Central Otago. The festival celebrates wines from the world’s most southerly vineyards. TIME: 10.30 a.m. – 4.30 p.m.
Grasshopper Rock Club guarantees you delivery of one case of each new vintage and special Club pricing.